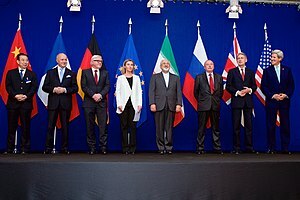 Its the third day since the draft framework agreement was signed in Lausanne, and there are already disputes regarding what the deal entails. A senior Iranian negotiator involved in the nuclear talks with six world powers rejected the US claims about the ‘suspension’ of sanctions after a possible final accord, saying that all the embargoes related to the nuclear issue will be lifted at once. Some people in Iran are under the impression that all U.S and EU nuclear related sanctions are to be removed. This view has also partially been endorsed by Iran’s chief negotiator, foreign minister Javad Zarif on twitter. The US state Department should translate the text of the agreement on their site into Persian, so that the Iranian public are left with no doubt as to what has been agreed and what has not been agreed.